Home Innovation Where Will the Next Prozac Come From? First, let’s get one thing straight. 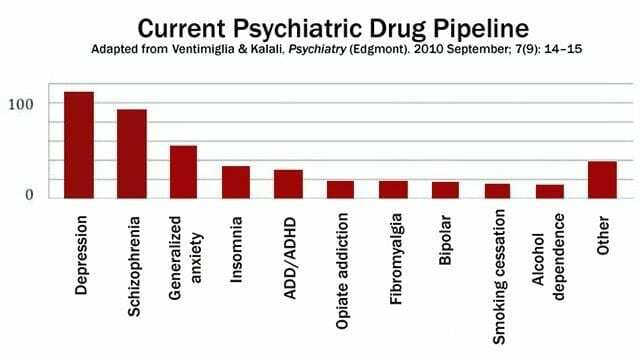 There is no “crisis.” A review of the new-drug pipeline shows that 137 active R&D programs have 417 ongoing development projects aimed at 19 psychiatric indications. Most of these programs are in Phase I or II trials. Psych-med R&D is more vigorous than ever. The discovery of all three major classes of psychiatric drugs, antidepressants, antipsychotics, and anxiolytics, came about on the basis of serendipitous clinical observation. At the time of their discoveries, the mechanisms by which these molecules produce their effects were unknown, and it was only later that antipsychotics were shown to be D2 receptor antagonists, antidepressants monoamine reuptake inhibitors, and anxiolytics GABA receptor modulators. It is interesting and perhaps instructive to consider whether any of these classes of drugs could have been discovered by current drug discovery strategies. For example, what genetic or preclinical data exist that point to the D2 dopamine receptor as a likely target for antipsychotic activity? Presently there are no genetic data that suggest that this receptor is expressed or functions abnormally in psychotic disorders. And without the benefit of the prior clinical validation, it is difficult to see how preclinical data alone would point to the D2 receptor as an interesting potential target for the treatment of psychotic disorders. The same can be said for monoamine transporters with respect to depression where, like psychosis, there are no animal models based on disease pathophysiology and no compelling preclinical data pointing to these as potential targets for antidepressant drugs. The best Big Pharma has been able to do over the years is craft me-too drugs once a serendipitous discovery has been made. But the serendipitous discoveries themselves (such as John Cade‘s discovery that injecting Guinea pigs with lithium urate made them placid) can’t be manufactured; they can’t be bought. They happen by accident.